Lahore/Islamabad: 30-07-2018: Delegation headed by Pakistan Muslim League (PML) President and former Prime Minister Ch Shujat Hussain and senior central leader and former Deputy Prime Minister Ch Parvez Elahi called on Pakistan Tehrik-e-Insaaf (PTI) Chairman Imran Khan at Bani Gala to a very warmly welcome. During exchange of views in a very pleasant atmosphere, Ch Shujat Hussain told Imran Khan that in the circumstances which have been developed we want to fully support you for sake of Pakistan. 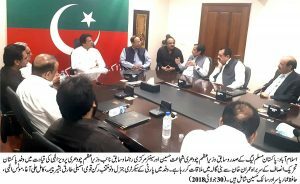 PML delegation included party’s Secretary General and MNA-elect Tariq Bashir Cheema, Kamil Ali Agha, Moonis Elahi, Hafiz Ammar Yasir and Salik Hussain. Praising the works undertaken in the Punjab during chief minister of Ch Parvez Elahi, Imran Khan said that you quite rightly served the Punjab, lot of work was done in the fields of education and health, brought the citizens closer through construction of Ring Road, during your government effective and result-oriented steps were taken in the fields of education and health, common and poor man were also facilitated.